Every year around this time I get this hankering to be crafty, or at least try my best to be somewhat creative. My first project came to mind when I visited my parent’s home and observed their über decorated Christmas tree. Ever since my siblings and I were little, my mother always decorated our family Christmas tree with ornaments we hand-made. We never had what I would call a “fancy” tree. You know the type, the ones with all matching colored balls, lights and store-bought ornaments. Yes, our tree was beautiful, but beautiful because it was filled with memories. Anyone can buy a “fancy” tree, but not everyone can have one with such history and love. So, our first project this weekend was a very simple craft, creating hand-made tree ornaments, which involved a little elf named Evan. 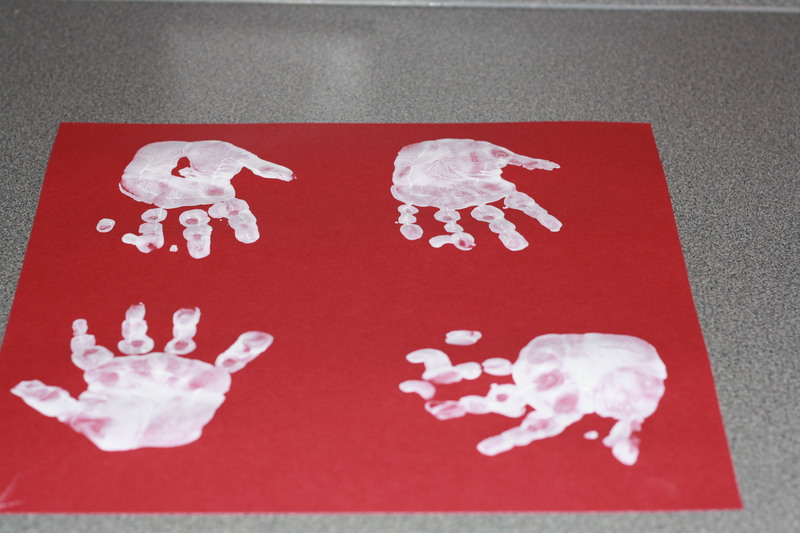 All we needed was cardstock ( I chose red and green) and children’s washable paint (I chose white). 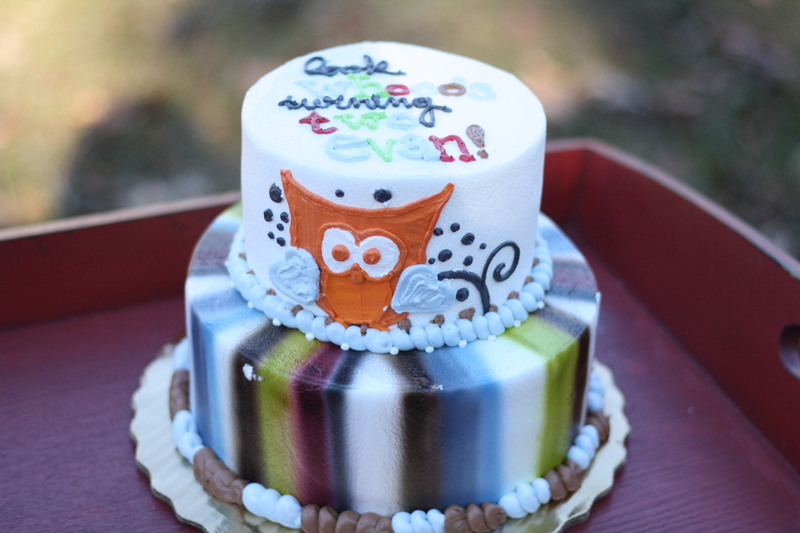 This is a great project for little ones and Evan absolutely loved it! 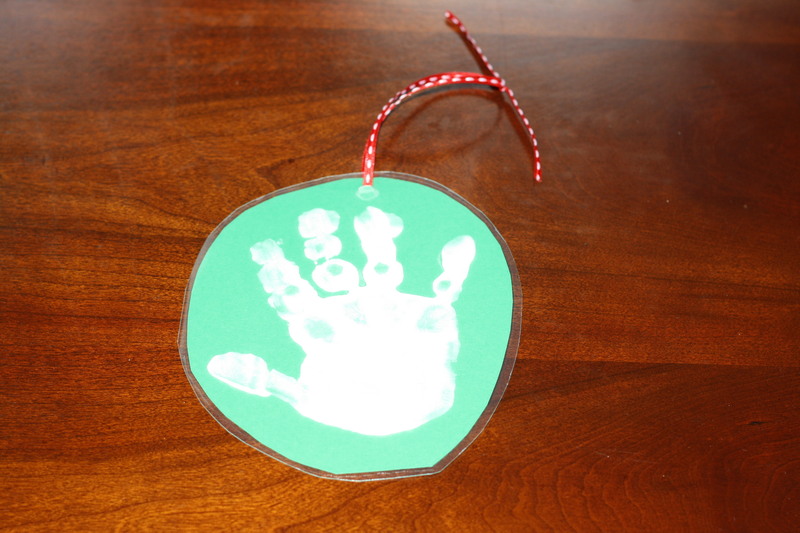 You might have to make extras because not all will come out with a perfect little hand print. We had to make several more, but I guess it also depends on your little artist. Out of the 18 we made, 12 were worthy of gift giving. After they dried completely, I headed to Staples and had them laminated. Lamination costs for all 12 hands was right at $12.00. Please note: before you rush off to the office store to laminate, remember to write your child’s name and the year / their age on the back or front. We forgot and had to write over laminate, which didn’t look too bad. Evan then assisted in cutting the ornaments from the laminate sheets, hence the not-so-round edges. 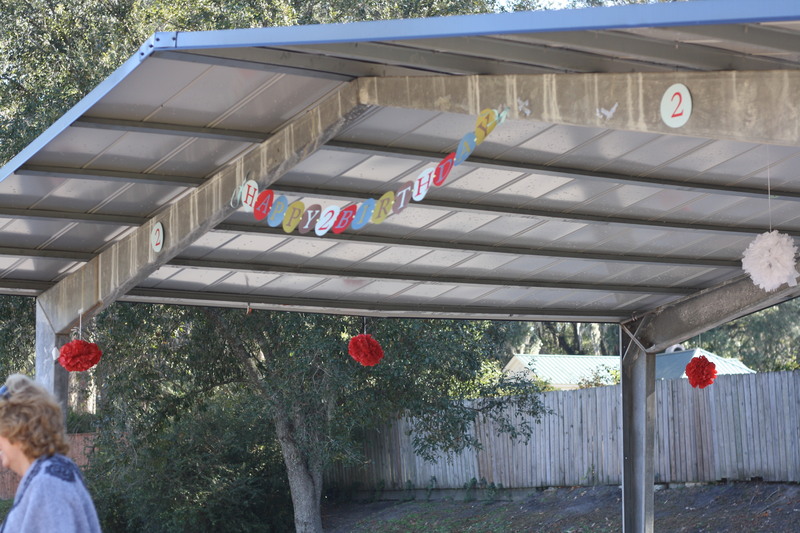 We finished them off with a little hole punch and hung with ribbon. Viola! I think these make the perfect gift for your little one(s) to give to their grandparents, aunts and uncles. Project #2 does not involve your child. Well, at least not mine. 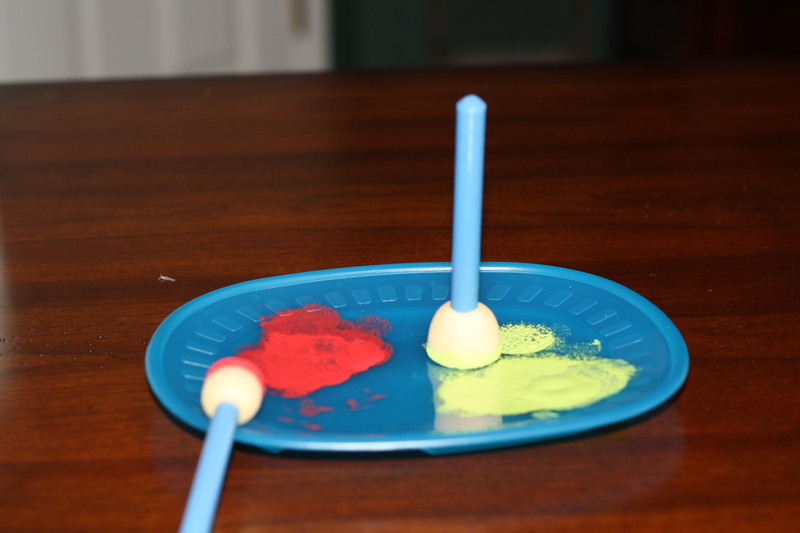 This craft is possibly more suitable for older girls and their moms. 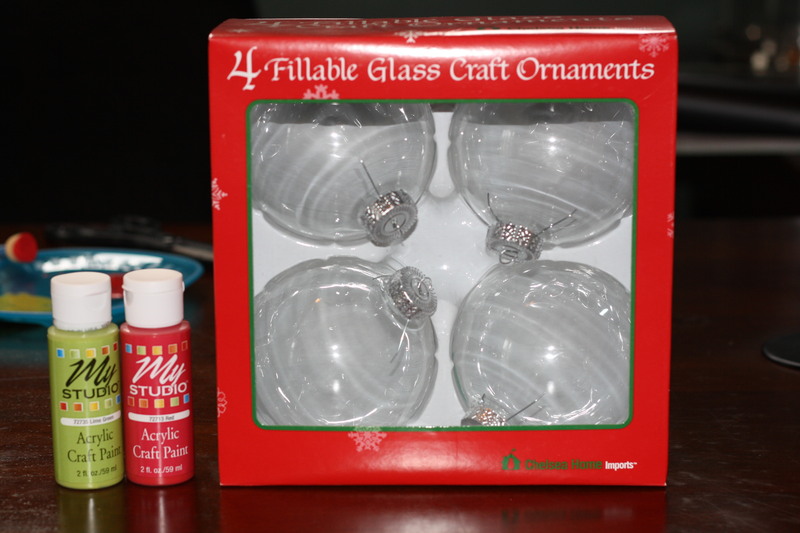 What you will need: glass ornaments, acrylic paint, paint utensils and ribbon. A.C. Moore has the ornaments on sale right now…a pack of four for $3.99. A.C. Moore also has the acrylic paint on sale for .59 cents each. First I “cricuted” the recipient’s first initial of their last name. If you do not have a Cricut machine, you can always paint on the initial or chose not to have one at all. 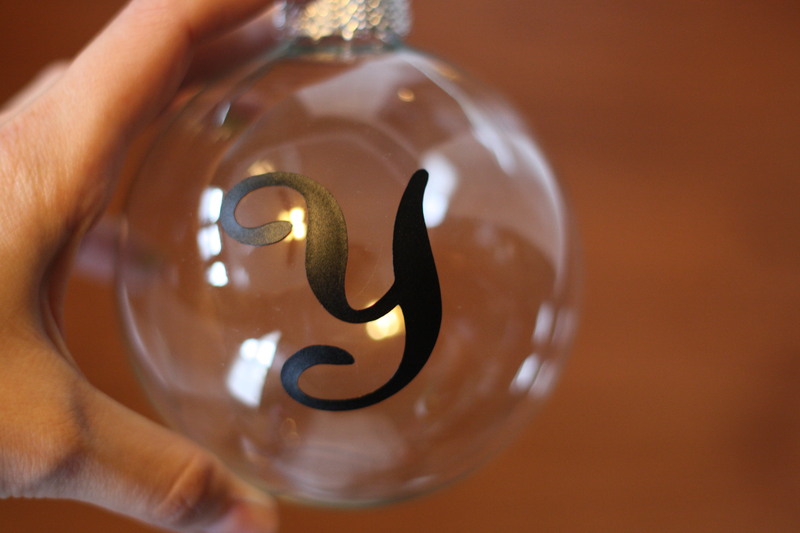 These type ornaments are also fillable, which could be filled with glitter, feathers, beads etc. I bought a pack of paint brushes for $3.99 and it came with 25 different brushes and these two gismos…perfect for polka dots! 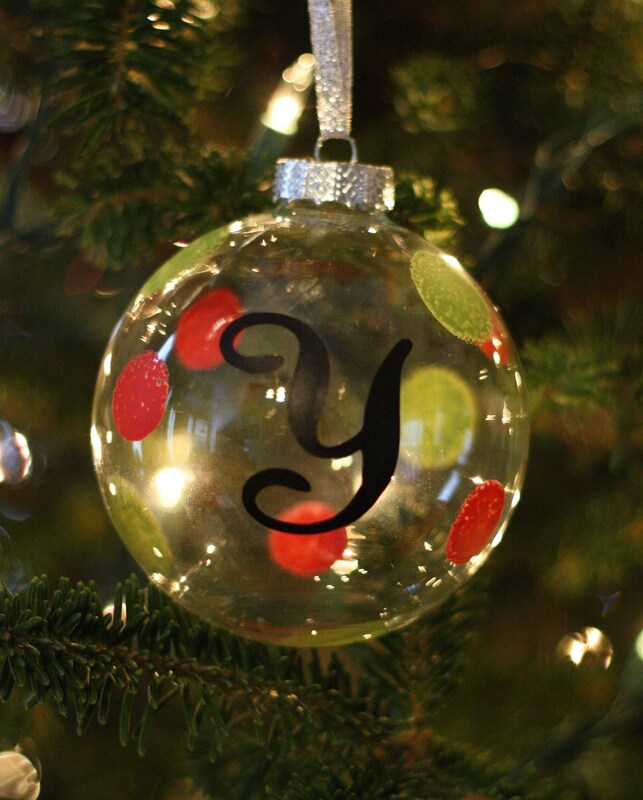 After I placed the initial on, I dotted my ornament with lime green and red. I finished it off with silver ribbon. If you’re needing a little gift for someone special, try these. Evan made one for each of his Sunday School teachers. Also, if you have a sports fan on your gift list, you could always decorate their ornament in their favorite team colors. Quickly changing the topic, Evan went to his asthma / allergy physician last week and tested negative for being allergic to eggs. This is very exciting news for us! 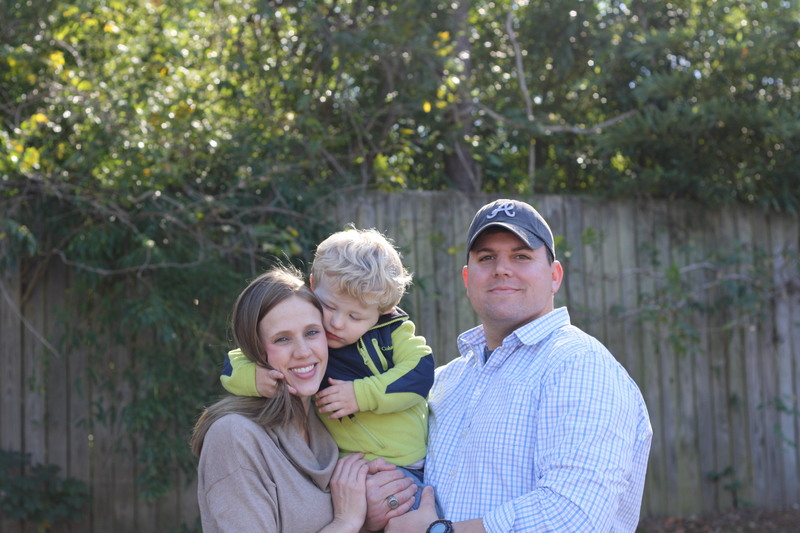 Our doctor originally told us that most children will outgrow this allergy and it appears, at least for now, that Evan has too. We will be visiting him again in January, where I will be bringing scrambled eggs in my purse. 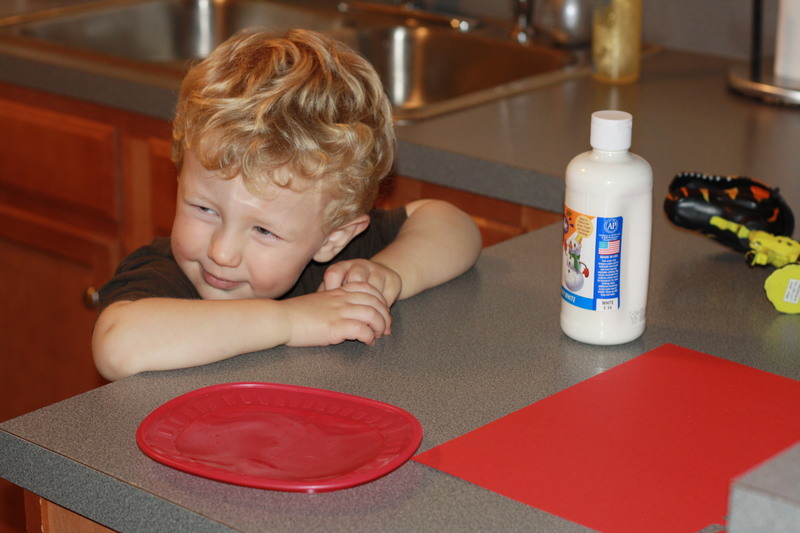 Even though Evan’s skin didn’t react to the test, the doctor still wants to challenge him by eating the eggs in his presence, mainly focusing on his respiratory function. So until January, no eggs! Also, while visiting the allergist, Evan received his flu shot. And he had no negative reaction (flu shots contain egg)! Now let’s just keep our fingers crossed and pray that he doesn’t get the flu! I cannot repeat that stage in my life again! I thought for sure at this visit he would be “on” the growth chart…but I was wrong. He is still “off” the chart (above) in all three categories. Since Evan was born, I’ve always enjoyed comparing his stats with his father’s (primarily to see what I’ll be up against in the next 18 years). At Lovebug’s two-year checkup, he weighed 40 lbs and was 37 1/2 inches tall. I can’t stop chuckling at that. Lovebug was an inch shorter but almost 5 lbs heavier than Evan! Apparently, somebody was a little husky two year old! Now moving on to the baby who lives inside me. On Monday, I had my 20 week ultrasound scan and baby girl weighed in at 15 ounces. But, most importantly, the scan showed a healthy baby. All we can do is continue to pray everyday that our Lord watches over and keeps his protective hands on our children. And me: I gained 5 lbs last month, for a total weight gain so far of 17 lbs. And on that note, this is what I’m looking like. 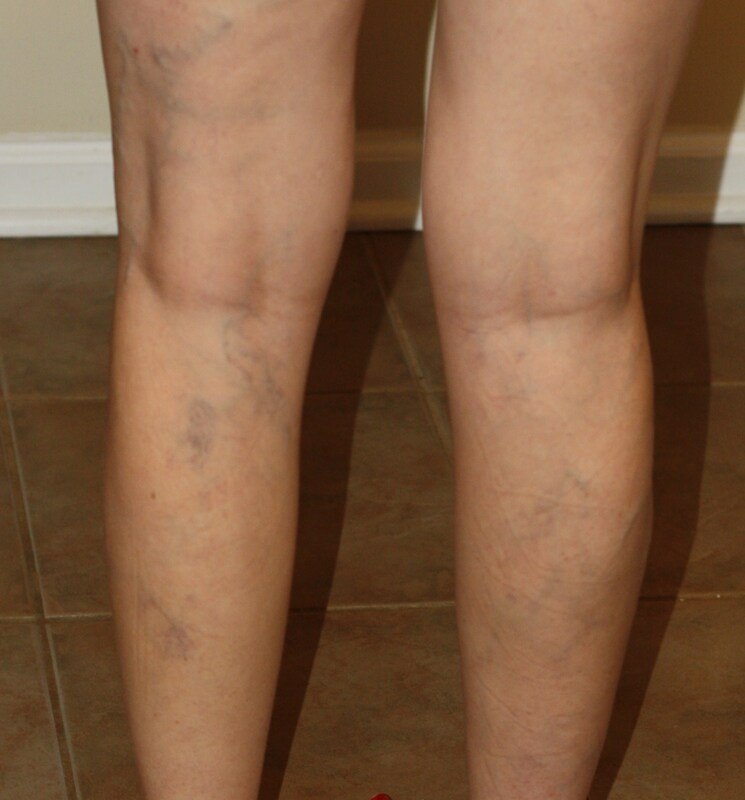 Full of varicose veins. Just lovely! Time has been moving right along for us! Our Thanksgiving was filled with adventure as we headed to Charlotte NC. We stayed at The Great Wolf Lodge, and in a nutshell, it was awesome! The Great Wolf Lodge is a huge resort and is known for its massive indoor water park (which stays a warm 84 degrees). There are so many things to do inside the lodge that you actually never have to leave the premises. 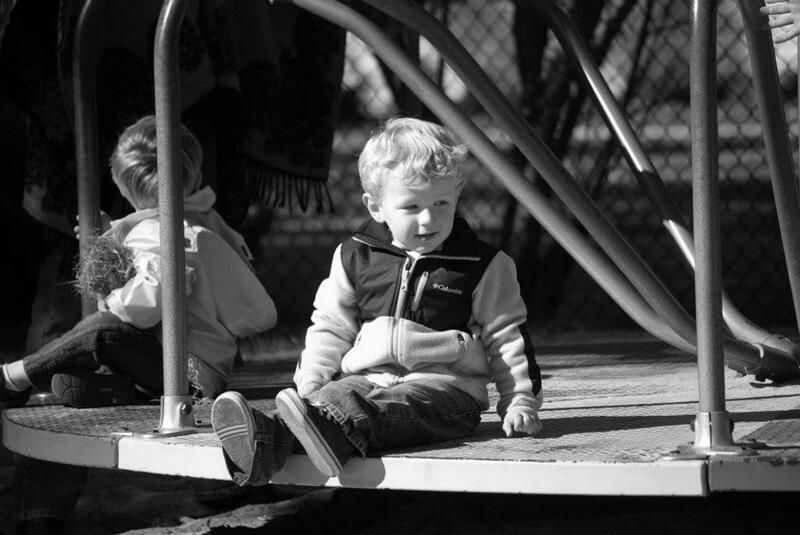 At first, we were a little hesitate about bringing Evan because we weren’t quite sure if he was old enough to enjoy it all. Well, after about 2.5 seconds of being there, we knew we would be in trouble come time to leave. This was Evan’s first road trip and he did so well. And I, apparently have already lost my mind because I forgot to pack the camera and wasn’t able to capture these candid moments. Overall, we had a very thankful Thanksgiving. Thanksgiving is perhaps my favorite holiday. It’s always spent with family and friends around a big feast enjoying each others company. No wrapping, no presents, and no gift giving to one another…the only giving is of thanks to the Lord. 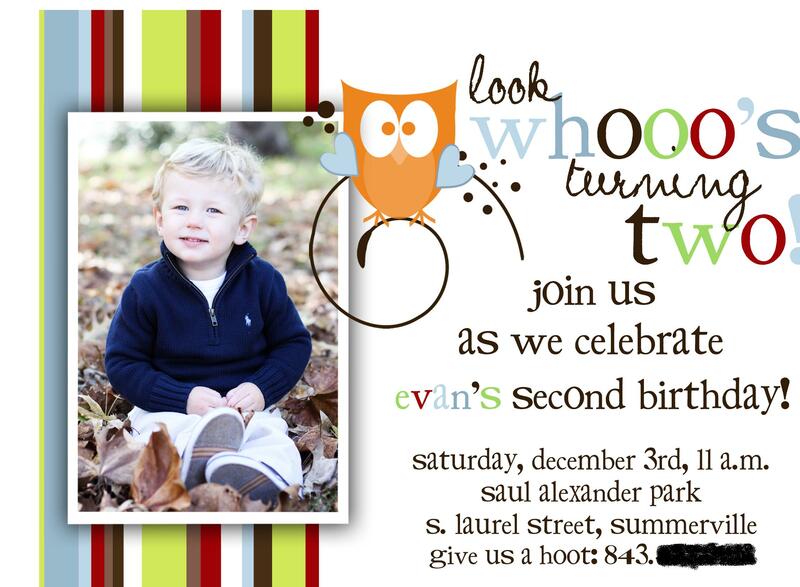 This past weekend we celebrated Evan’s 2nd birthday. First Step: Invitations and matching Thank You’s. 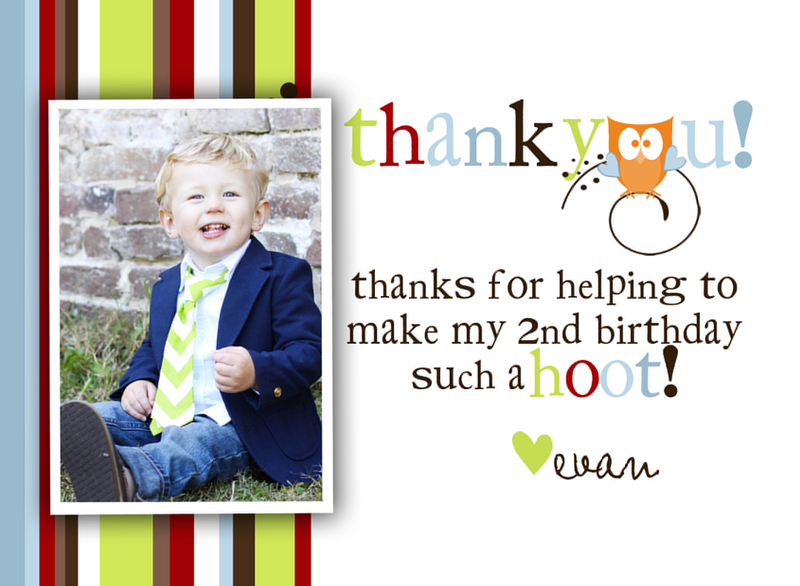 I contacted Kottage on 5th and had the talented owner design our invitations and matching thank you cards. We used her last year and continue to be very pleased with her work. Go check her out! 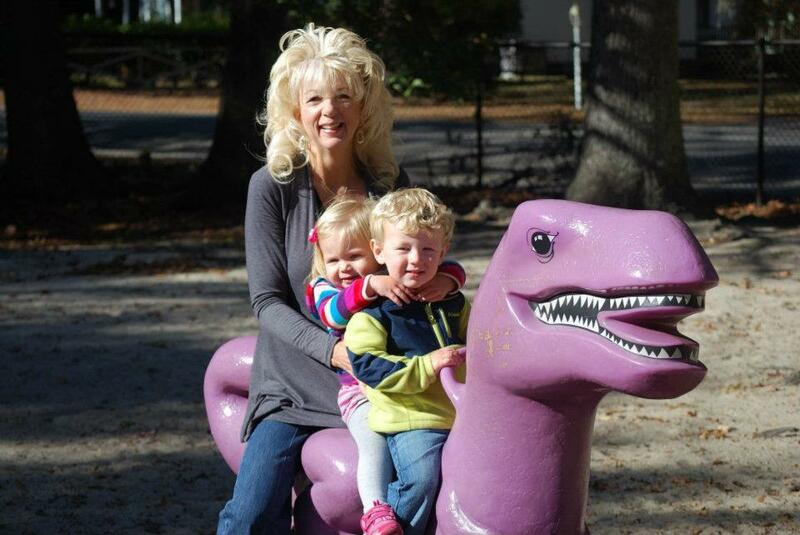 We decided to use the Saul Alexander Park , a local park in Summerville, for Evan’s birthday location. 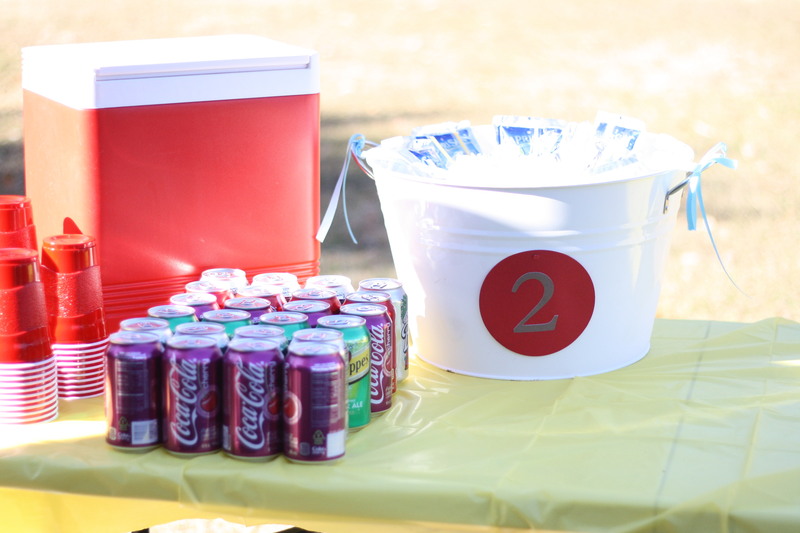 All town parks in Summerville are on a “first come first serve basis” when it comes to reserving one for a party, so I knew it was imperative to have the party early in the day so we were guaranteed to have it. 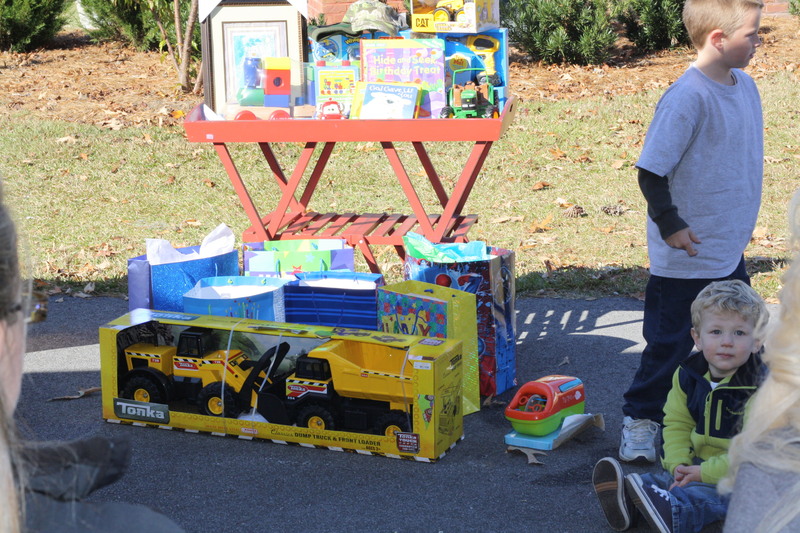 We decided to start the party at 11:00 am and we were there at 10:00 am to set up. The Saul Alexander Park is where both my parents and Tim’s took us to play when we were young, and now we get to take Evan there! And here’s where I almost lost my religion and sanity with Cricut. 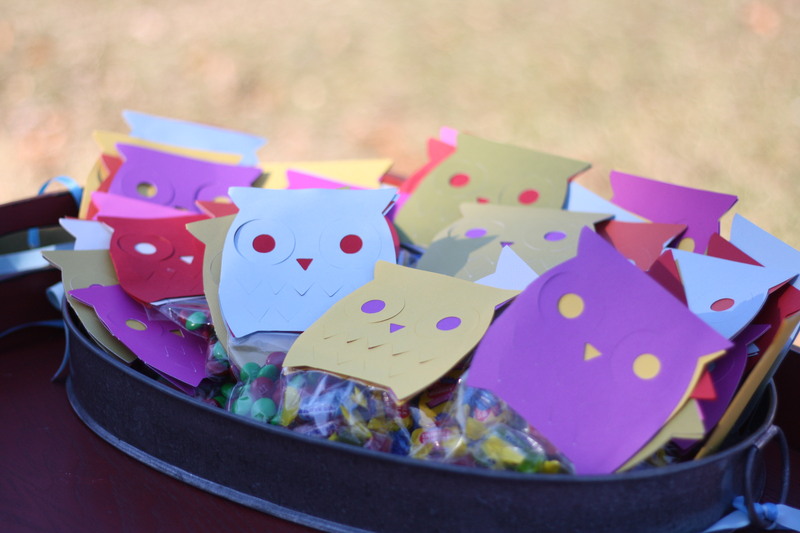 It started when I found an owl design on my Wild Card cartridge and decided to make these party favors with it. The time consuming part was making the owls. The designs were completed by attaching a goodie bag. I was quite pleased with the cake we ordered. We got it from Publix and paid $27.98. I’m very proud of that price considering I paid doubled that for his cake last year. 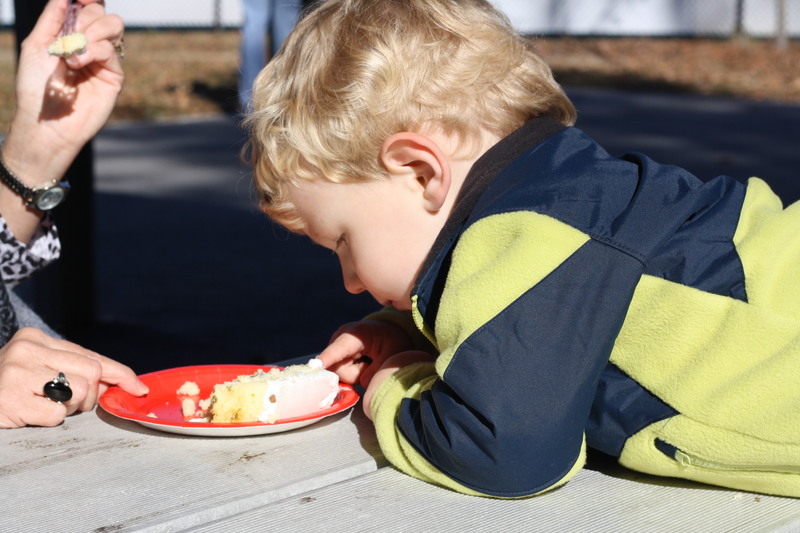 How come kids can always manage to stick their little fingers in the icing before it’s time to eat? I decided to keep the food and beverages simple. We ordered Little Ceasar’s pizza and chugged it down with sodas, water and Capri Suns. FYI: All town parks do allow you to bring a grill, but you must visit Town Hall for a grill permit if you wish to grill out. Grill permits are free. We discussed doing this, but decided with pizza. And here are a few pictures of the birthday party in action. And this is when you know you have a tired baby! 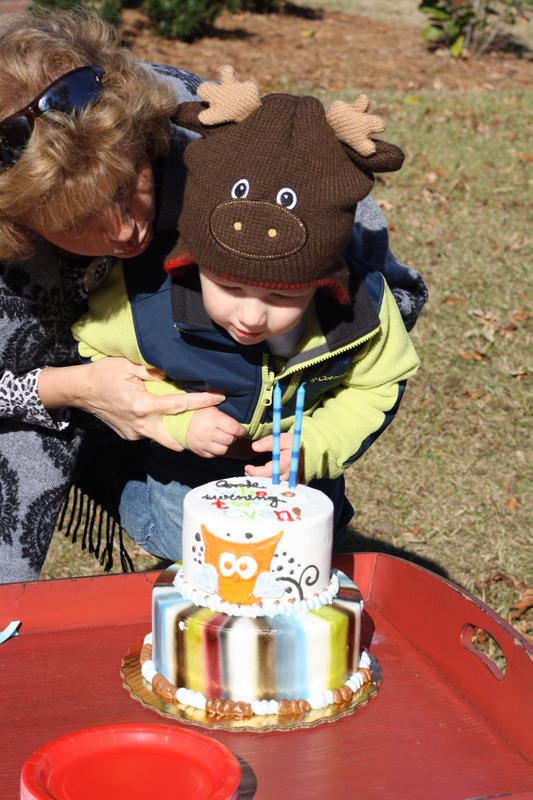 Special thanks to all our friends and family who helped make this a spectacular day for our 2-year-old little boy!